【Updated Version.】 All the three phone lens are updated. For the fisheye lens, no annoying dark circle and blurry images around the pictures. 【Unique and Humanized Design.】 The 24X Super Macro lens is circled by a transparent layer, with which you can fix the distance when you captured extreme tiny things. 【Discover the Macro World.】 12X Macro lens and 24X Super Macro lens are connected together. With these two lens, you will be amazed at the fantastic super macro world! 【User-friendly.】 Fully Equipped with 2 universal clips, you will not be bothered to screw off lens when you want to change the other one. Besides, the soft cushions on the clips can protect your cell phone from scratch. 【Humanized Design.】 Comes with a cloth bag for carrying and cleaning lenses, which makes your journey easier. 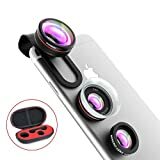 Note: This 3 in 1 Clip-On Lens Kits are compatible with iPhone 6s+/6s/6+/6/5/5s/4/4s, iPad Air 2/1, iPad Mini 3/2, Samsung Galaxy S6 Edge/S6/S5/S4/S3/A7/A5, Galaxy Note 4/3/2, Blackberry Bold Touch, Sony Xperia, Motorola Droid and other smart phones. 24X Super Micro lens takes you to explore the extreme tiny world. The 24X super macro lens is a fantastic lens. Use this lens, you can explore the world which is invisible in naked eyes. You can even clearly see the texture of paper. Fit for rear facing and front facing cameras. 1. 12X Macro Lens and 24X Super Macro Lens are connected together. When you use the24X Super Macro Lens , the 12X Macro Lens and 24X Super Macro Lens must be screwed together. This entry was posted in Discount Photography and tagged +12X, Black, Circle, Clip, Dark, FishEye, lens, Macro, Smartphones, Super, VicTsing by Ball Photo. Bookmark the permalink.